It's time to get excited about Raisin Bran again. Let's get the only negative out of the way. There aren't as many almonds as the picture on the box would have you believe. There's a decent amount - possibly the perfect amount. Cinnamon makes a huge impact in this cereal. Flakes that once tasted familiar and ordinary are taken to a new and better level. Set against the backdrop of cinnamon, the raisins seem to take on a new life. Notes of honey suddenly burst forth like a 2009 Sauternes Sweet Bordeaux. Skeptics might consider a dust of cinnamon and a few almonds to be a minor change ("Big whoop, so they added some spice and nuts. "), but these seemingly minor changes transform a classic cereal into something that tastes entirely new. The flavor comparison that comes to mind is a homemade oatmeal raisin cookie (despite the cereal having no oats). If you've never liked Raisin Bran, I encourage you to try this cereal. If you love original Raisin Bran, go to the store today. It's that good. Nutritional Considerations: Each 1 and 1/4 cup serving has 200 calories, 1.5 grams total fat (0 trans and 0 saturated), 0 mg cholesterol, 47 grams total carbs, 5 grams dietary fiber, 18 grams sugar and 4 grams protein. The first four ingredients listed on the side panel are whole grain wheat, rice, sugar and raisins. IMPORTANT NOTE: Kellogg's Raisin Bran is higher in sugar than most people realize. 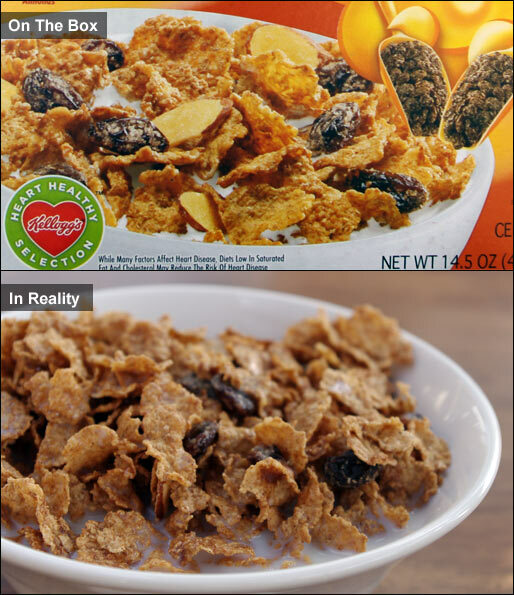 Original Raisin Bran and this new variety both have 18 grams per serving. That's actually 3 grams more per serving than the company's Honey Smacks cereal. In defense of Raisin Bran, a serving of Honey Smacks is almost half the size. 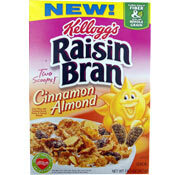 What do you think of Cinnamon Almond Raisin Bran? Where can I find it? Have tried everywhere with no luck. My area is Westchester County, NY. I love this cereal with vanilla soy milk. 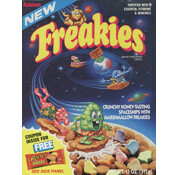 I went to 2 markets that previously sold this cereal but could not find it or a listing of products on shelves! This is one of my new favorite cereals.